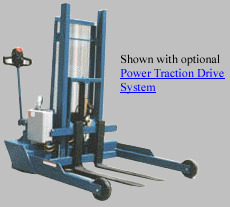 The Pallet Server, series V-PM/PS, is designed to be used when a fork truck is not available. 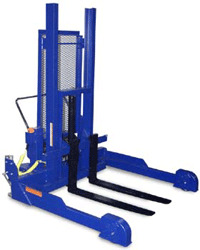 The Pallet Master can handle pallets, skids and crates both with and without an understructure. The standard unit has a maximum capacity of 4,000 pounds with a load center within 18 inches from the vertical part of the fork. The 4" wide forks are adjustable from a 8" wide minimum, to 37" wide maximum. The forks are 36" long for handling a wide variety of pallet sizes. 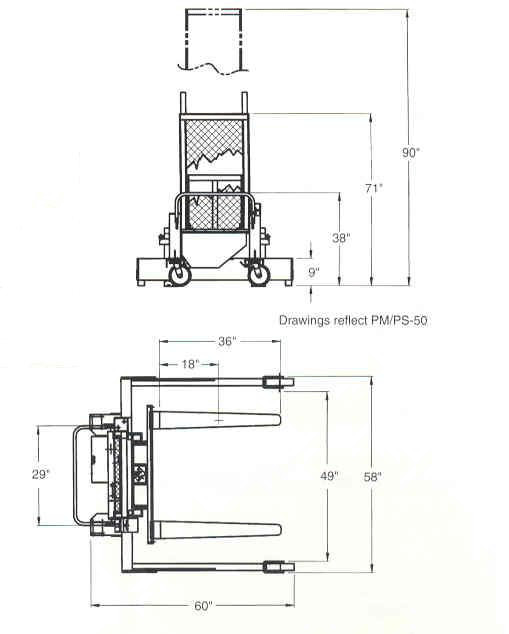 The units rolls easily on two 8" x 3" phenolic swivel rear casters (8" x 2" standard on V-LL-PMPS models). Floor lock standard. Handle height is 36". Outriggers are adjustable from 30" to 50" on V-LL-PMPS series. DC Powered units have an on-board charger. Push buttons to raise and lower lift are located on power unit. Hand pendant control on 8 foot coil cord standard. Key operated ON/OFF control for better security is built into the power unit. Models V-LL-PM/PS (Pic. 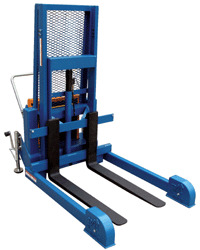 4) - Light duty lift - 1200 lbs. Capacity - Features adjustable straddle legs 30" to 50"